Halloween Time has brought a whole new ambiance to Buena Vista Street. In particular, the purple lighting creates a spooky environment emotive of a villain's domain. This makes sense, because the overlain storyline at California Adventure is that Oogie Boogie has taken over the park. Certainly, that would include the lighting, so naturally, things look and feel a little a little sinister. But I still love it. 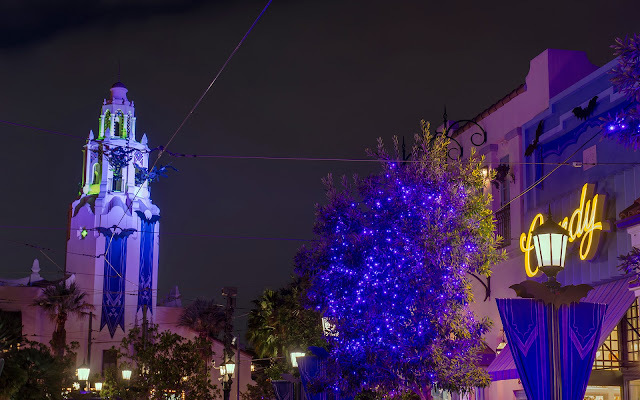 The purple lighting of Buena Vista Street during Halloween Time provides a spooky atmosphere.